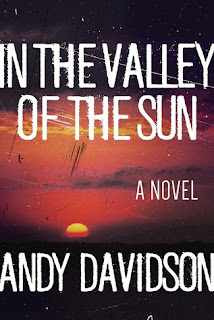 In the Valley of the Sun is Andy Davidson's debut horror novel. Travis Stillwell spends his nights searching out women in West Texas honky-tonks. What he does with them doesn’t make him proud, just quiets the demons for a little while. But his nights soon take a terrifying turn in a desert cantina, where Travis crosses paths with a mysterious pale-skinned girl in red boots. Come the morning, he wakes weak and bloodied in his cabover camper, no sign of a girl, no memory of the night before. Annabelle Gaskin spies the camper parked behind her rundown motel and offers the disheveled cowboy inside a few odd jobs to pay his board. Travis takes her up on the offer, if only to buy time, to lay low, to heal. By day, he mends the old motel, insinuating himself into the lives of Annabelle and her ten-year-old son. By night, in the cave of his camper, he fights an unspeakable hunger. Before long, Annabelle and her boy come to realize that this strange cowboy they’ve taken in is not what he seems. Half a state away, a grizzled Texas ranger is hunting Travis down for his past misdeeds, but what he finds will lead him to a revelation far more monstrous than he could ever imagine. A man of the law, he’ll have to decide how far into the darkness he’ll go for the sake of justice. In the Valley of the Sun reminds me of my experience with The Girl with All the Gifts. I went into it not knowing what kind of horror book it was, and my experience was much better for it. In the Valley of the Sun never actually names the horror so I'm not going to either. My hope is that you will give it a chance without finding out too much about it. It's a really great book, but it's a great experience, too. One of my favorite things about In the Valley of the Sun was the slow unveiling of what was really going on. In the Valley of the Sun is scary, too. I was so nervous for everyone, even the villains. Only the best of horror novels can make you love the villains, and In the Valley of the Sun is one of those books. 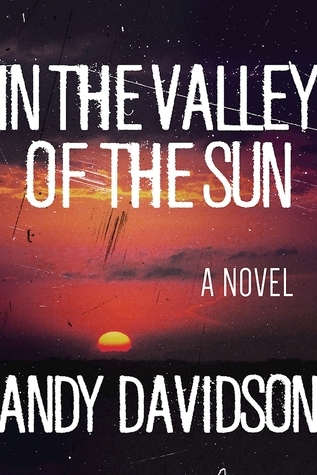 As much as I love the horrors in In the Valley of the Sun, every bit of the credit goes to Andy Davidson's writing. This book is so well written and so well crafted. He has given us a really beautiful addition to an old horror myth, and I could not be more excited about it. This has been an amazing year for horror releases, and you will definitely see In the Valley of the Sun on my best of list for the year (maybe even in the top spot). Wow high praise. And I like how it's ambiguous what the evil is- I have a few ideas but now I'm really curious to find out! I don't read a ton of horror but this one... I may have to. You do discover exactly what the evil is even though a name is never put to it. There are definitely some horrible scenes. There's no getting around that, but it has a western feel to it, and it would definitely appeal to those who love both crime fiction and horror. I think the fact that it is so well written will appeal to a larger audience. I hate to use the term literary horror because people get up in arms about the term, but... it's literary horror. Wow! High praise! I'll have to check it out. I hope you get a chance to read it. I'd love to know what you think. Ooh, I like that! Any reason to read horror is a good reason. :) You do make a good point. Holy crap, you make this one sound so good! A horror so good that makes you feel for the villains too? That is really rare, and it makes me want to read this even more now. Thanks for the review! I'm definitely bumping this one up my TBR. I really, really dug this one. I can't wait to hear what you think. I hope you connect with it, too. Awesome review. I'm really wanting to read this one. Going to see if my library will order a copy in - I'm trying not to buy too many books!